Mirror Balls are a great way to enhance any light show. This mirrored disco ball is handcrafted in the USA by Omega National Products using premium materials. This mirror ball has a spun aluminum core and is reinforced with a steel rod at the center for extra strength and durability. 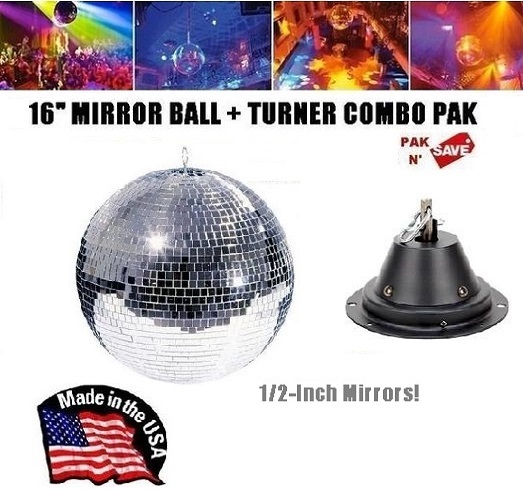 This mirror ball has large 1/2" mirrors, which when used with the proper lighting will create larger beams for a more dramatic and exciting effect over a larger area. ADJ M101HD 1 RPM Motor Turner - handles up to 22 lbs.